Recently, I've fallen in love with juicing--not as a way to lose weight, but as a way to add nutrients to my diet. Drinking freshly pressed juice has tons of health benefits and, of course, it tastes delicious. To get me started with my new juicing endeavor, BELLA Appliances sent me their BELLA NutriPro Juicer to try out. Recently, I've fallen in love with juicing--not as a way to lose weight, but as a way to add nutrients to my diet. Drinking freshly pressed juice has tons of health benefits and, of course, it tastes delicious. To get me started with my new juicing endeavor, BELLA Appliances sent me their BELLA NutriPro Juicer to try out. I have to admit, when I pulled the machine out of the box, I was a little intimidated. There were so many parts and pieces! But, after spending a few minutes with the instruction manual, I had the NutriPro Juicer all set up and ready to go. The NutriPro Juicer is easy to use. You can pretty much toss any raw fruit or vegetable into it, even hard produce like beets and sweet potatoes. You just need to make sure you cut them into small pieces first, which also speeds up the juicing process. In addition to these ingredients, I added big bunches of leafy greens (collards, kale, spinach) to my juice. I didn't need to cut up these beforehand, but they needed to be pushed down with a plastic "food pusher," which comes with the juicer. While you don't have to buy a juicer—you can also use your blender—they do come in handy. Most are $150 - $300 (this one retails for about $250), depending on how fancy you get. I’m still figuring out what combination of fruits and veggies I like best, but, right now, my favorite juice to make is beet, cucumber, and apple with fresh ginger. It's so tasty--and colorful! Before using the NutriPro Juicer, I didn’t realize there were different kinds of juice machines on the market. The NutriPro is a cold press juicer, which compresses fruits and vegetables to extract the juice while centrifugal machines use fast, heat-generating blades to pulverize produce into juice. Cold press machines tend to produce more juice because they allow more liquid to be extracted from each fruit and vegetable, which is great because I don't need to buy a ton of fresh produce to make juice on a regular basis. When it comes to clean up, the NutriPro Juicer was easy to take apart and wash. I had previously heard horror stories about the whole process of trying to clean juicers from start to finish, so I was pleasantly surprised how little time it took to clean the NutriPro. All of the parts are removable, so they can go straight into the dishwasher after making juice. If you want to wash the machine by hand, it only took me about 4 minutes to take everything apart and wash it, which is totally worth it for fresh juice! 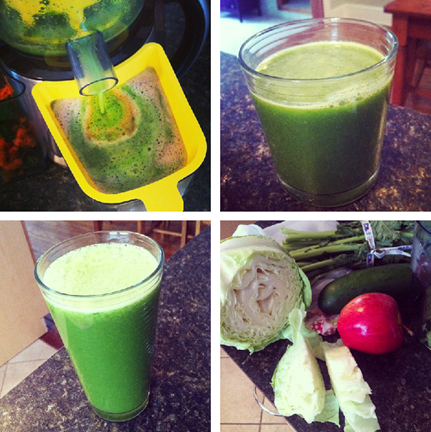 This was actually my first experience with a juicer, and I found it to be really easy. Since I use it almost every day now, I think they are definitely worth the money. Disclaimer: I received a complimentary BELLA NutriPro Juicer. The thoughts and opinions are all my own.